The DNS tab allows you to configure the system's hostname, domain, name servers, and search domain. 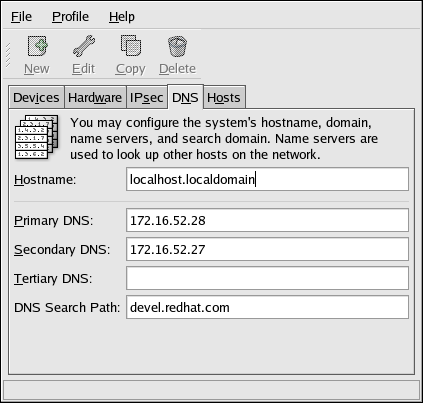 Name servers are used to look up other hosts on the network. If the DNS server names are retrieved from DHCP or PPPoE (or retrieved from the ISP), do not add primary, secondary, or tertiary DNS servers. If the hostname is retrieved dynamically from DHCP or PPPoE (or retrieved from the ISP), do not change it. The name servers section does not configure the system to be a name server. Instead, it configures which name servers to use when resolving IP addresses to hostnames and vice-versa. If the hostname is changed and system-config-network is started on the local host, you may not be able to start another X11 application. As such, you may have to re-login to a new desktop session.